Cyanobacteria are recognized as important colonizers and protectors of soil surfaces, particularly in biological soil crusts (BSCs) of arid and semiarid regions. Comparatively, little attention has been paid to the growth of cyanobacteria, algae, and moss on agricultural soils in more humid regions like eastern North America. Growth of soil surface consortia (SSCs) in agricultural fields is typically rapid and ephemeral yet recurrent, thereby differing from classical BSCs of semiarid regions and algal mats of aquatic systems. Naturally occurring or intentionally applied cyanobacteria to agricultural soils could thus provide renewable sources of carbon and nitrogen (N) and a means to improve soil resilience. 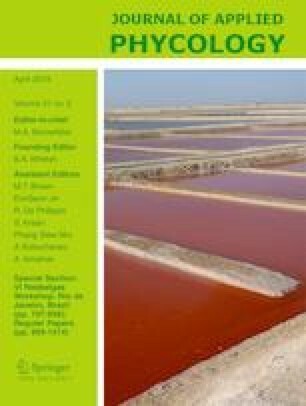 Here, we describe a soil microcosm-based protocol to assess cyanobacteria for their ability to form SSCs using three criteria: reliability of serial transfers in N-free culture media, robust growth in soil microcosms, and resistance to detachment from soil particles subjected to water flushing. Screening of 100 enrichment cultures from local SSCs yielded three that exhibited robust growth on N-free solid media and consistent microscopic appearance as filamentous, heterocystous cyanobacteria. One enrichment (DG1) grew reliably in liquid N-free media and was selected for comparison with pure cultures of commercial strains of other heterocystous cyanobacteria. Growth and biomass density of DG1 and commercial strains on moist, N-limited soils were tracked using chlorophyll a measurements and water flush tests. Anabaena spp. grew faster on soil surfaces, but their 80-day SSCs did not adhere to soil as well as DG1 or Nostoc spp. in water flush tests. The ability of DG1 and Nostoc spp. to produce flocculated growth in liquid culture appeared to be associated with greater soil adherence. While Nostoc spp. formed stable SSCs in soil microcosms, they exhibited lower growth rates and biomass densities than DG1. Attempts to purify the cyanobacterial strain(s) from other bacteria in the DG1 enrichment were unsuccessful. Based on initial metagenomics analysis, the DG1 enrichment was a consortium containing at least six other bacterial genotypes but dominated by one or more closely related strains of Cylindrospermum spp. (Nostocaceae). The presence of bacterial associates did not interfere with rapid growth and high biomass density in soil microcosms, as well as SSC stability in water flush tests. The artificial SSCs formed by DG1 showed good potential for use as a renewable N source for agroecosystems. The online version of this article ( https://doi.org/10.1007/s10811-018-1597-9) contains supplementary material, which is available to authorized users. Constructive suggestions by two anonymous reviewers are gratefully acknowledged. We thank Dr. Yemin Lan, School of Biomedical Engineering, and Dr. Gail Rosen, Department of Electrical and Computer Engineering, of Drexel University, for the bioinformatics assistance. We thank Dr. Don Bryant, Penn State Dept. of Biochemistry and Molecular Biology, for the advice on culturing, and Dr. Richard Macur, Center for Biofilm Engineering at Montana State University, for his insightful comments. This research was funded by an internal Research Applications for Innovation grant from the College of Agricultural Sciences of The Pennsylvania State University. The USDA-NIFA Hatch project #1003466 provides salary support for MAB.